Tweets for eats | One year, one job. 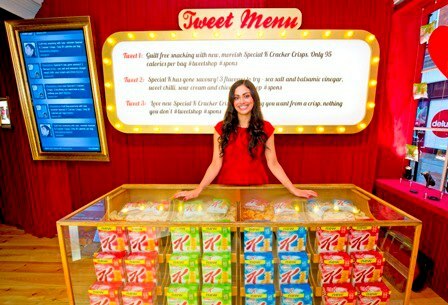 Yesterday Kellogg’s UK launched a new initiative encompassing digital media and a shop front to encourage shoppers to tweet about their products in exchange for a box of their new Special K Cracker Crisps. It’s not the first time tweets have been used as a form of currency, at BT London Live in Victoria Park this summer, visitors were asked to show a tweet including a select hashtag to Cadbury’s staff in order to receive a free chocolate medal. It does seem to be – or at least according to Kellogg’s – the world’s first Tweet shop. Visitors are asked to tweet one of three specific tweets in exchange for their goods. A search of Tweet 1 finds only 3 tweets from launch day, Tweet 2 had nine results and Tweet 3 just one (which was also marked with #spons for clarity). Time will tell if this proves to be a good marketing move – as word spreads hopefully the campaign and social buzz will pick up. The flaw is obviously the London-centricity of the campaign but they’re hardly the first company to do so. Fans on the Kellogg’s UK Facebook page are already asking if there’ll be a national tour. The Tweet shop is open 9am-5pm until Friday at 13 Meard Street, London, W1.